For full disclosure, I asked two separate Orthodox Rabbis to co-officiate my wedding – with the other officiant being from the Karaite Jews of America. In the end, neither Orthodox Rabbi was able to officiate the wedding. Because my wife is active in a few different orthodox communities; it was important to us to have both Karaite and Rabbanite traditions represented as much as possible. For example, although Karaites do not “wash” (in the Rabbinic sense) before meals, we set up a washing station so that Orthodox Jews would be able to fulfill their rituals before dinner. A picture of the washing station was even featured in Martha Stewart Weddings. No big deal. Before we get into the wedding details, I want to make clear that all of the Orthodox Rabbis considered me, as someone descended from Egyptian Karaite Jews, to be Jewish. Most of the rabbis took it for granted that I was Jewish, and one of them even investigated my family lineage before determining that I was halachically Jewish. The first item I discussed with several Orthodox Rabbis (not just those whom we considered as officiants) was the language of the ketubah. It was of paramount importance to me, as a Karaite, that the ketubah be written in Hebrew. In the Rabbinic tradition, the ketubah is written in Aramaic. One Orthodox Rabbi (a friend of mine from Aish HaTorah) suggested that we write the ketubah in Aramaic and translate it into Hebrew in the same document. His reasoning was that a ketubah is valid if it is written in Aramaic and translated into English; so he would see no problem writing it in Aramaic and translating it in Hebrew. A Hassidic Rabbi we spoke with was a little less certain as to whether this approach would be valid according to Rabbinic halacha, and suggested that we have our main wedding ketubah in Aramaic and that I have a separate document in Hebrew for my wife and me. My various Orthodox Rabbi contacts and I also discussed the number of witnesses to the ketubah. In the Karaite tradition, a marriage occurs in the presence of ten people. [1.] And men or women may sign the ketubah. I was willing to have two Orthodox Jewish men sign the ketubah to fulfill any Rabbinic requirements; but the Aish Rabbi was concerned that if the ketubah was signed by more than the two Rabbinically required witnesses, someone might draw an inference that there was a concern about validity of the two “required” (i.e., orthodox Jewish male) witnesses. The Hassidic Rabbi was not sure that the presence of more witnesses would cast doubt on the validity of the two proper witnesses, but he wanted to think about this. A third Orthodox Rabbi saw no problem with it. I previously posted the video explaining how my wife and I addressed the witness issue. 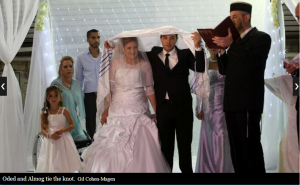 Although I am sure that the custom varies among Jewish communities, as a general matter a bride does not speak during the chuppah ceremony at Orthodox weddings. One final aspect of the traditional Karaite wedding ceremony that I find beautiful is the exchange of vows. And I will betroth you to me forever; and I will betroth you to me in righteousness, and in justice, and in loving kindness, and in compassion. And I will betroth you to me in faithfulness; and you shall know Hashem. Set me as a seal upon your heart, as a seal upon your arm; for love is as strong as death; jealousy is as cruel as the grave. Its flashes are flashes of fire, the flame of God. I should note that although no Orthodox Rabbi was able to officiate the wedding, everyone I spoke with did everything they could to try to make it work. They were on the phone with Rabbis across several continents; they read responsa. Even the rabbis whom I did not ask to co-officiate the wedding tried to come up with creative solutions within the orthodox halacha, in the hopes that they could help bring joy to my wife and me on our wedding day. And I thank them for that. In case anyone is wondering, I *do* do weddings. And I’d be happy to make “someone else’s simcha” a part of your own. So if you have a desire to incorporate something Karaite into your upcoming nuptials, drop me a line and I’ll give you some pointers. This is rooted in the marriage of Ruth to Boaz, in which Boaz gather 10 elders from the town (Ruth 4:2) and had them as witness for his marriage to Ruth (Ruth 4:10). It seems that Anan ben David (who led a non-Rabbinic movement called the Ananites) believed that “Each man marries in the presence of ten local people.” See Karaite Marriage Documents from the Cairo Geniza, Dr. Judith Olszowy-Schlanger, p. 261. So it is a Karaite tradition for ten witnesses to sign the ketubah. Leave it to the Rabbanites to insist that the ketubah be written in Aramaic and translated into Hebrew, and that the reverse wouldn’t be good enough, which it wasn’t anyway as none of them attended. I’m humored by the Hassidic rabbi who had to think about it. Doesn’t this new religion of Rabbanism have enough opinions? I think yours or mine would work just as well if we are conscientious. It sounds like a mixed marriage of two Jewish people. I get your frustration, but in fairness these things are complicated. And they tried to figure it out. To your point, though, check out why Rambam does not recognize Karaite divorces. Well my Ketubah was made of parchment and written in Aramaic. It had to be worded a certain way. Its actually quite a great feeling to know your marriage contract(boy talk about prenups) was in our Hebrew forefathers language. And two witnesses and it was a done deal. I believe Hebrew and Aramaic can be used but both would certainly make for a fine legal document. But regardless Mazal Tov to these young family members of our nation newly betrothed. We all have reason to celebrate. I understand your desire to keep YHWH’s name in awe and fully respect it. Yet the result ends up compromising it. Hoshe`a 2:22 actually states “And I will betroth you to Me with faith, and you shall know YHWH”. So, who did end up officiating at the wedding? How was the decision made? We used a representative from the Karaite Jews of America, and a friend (a lawyer). Interesting that the quorum of ten men req. for Rabinic prayer is also derived from that verse in Ruth.